Many working professionals are ‘Reluctant Networkers’. They do not like the thought of 'cold calling' friends of friends, joining networking clubs or going to networking events where they have to ‘work’ a room full of strangers. Written by a 'Reluctant Networker', this guide supports you in developing your networking skills in ‘bite-size chunks’ rather than having to do a complete makeover. One of Neil Munz-Jones's opening definitions of a reluctant networker reveals that his will be a pragmatic book: "You prefer email to the telephone for contacting new people or ones you do not know well". Don't we all fall into that trap so easily? "The Reluctant Networker" is your antidote! If anyone doubted the importance of networking, Neil Munz-Jones provides evidence that up to 70% of positions are filled via networking and he recounts the unlikeliest of examples of how networking led to the sale of new consulting projects. The book is built on a sound premise, namely, that networking is "a two-way thing". This is not about "using" people but about building relationships which will be mutually beneficial. The author reminds us that it is easiest and most effective to network when you do not need a specific outcome, rather than when you are looking for a new job or trying to sell a new project. Laying the groundwork in advance is the key: networking should become "a lifelong approach to doing business". The book contains many practical tips for making your networking more effective, for example, how to prepare for and what to include in a call, how to focus and spot tell-tale signs of networking which will lead nowhere, how to get the best out of networking events. There is advice about how to "develop a style that works for you", how to make it easy for others to network with you and encouragement for those inevitable rejections. "The reluctant Networker" is an easy yet compelling read which will help to make anyone who is nervous about networking feel more at ease and be more effective. It also answers that golden question: why do some people help when it seems that there is nothing in it for them? Well, "never underestimate the willingness of people to help 'because they can'. You just need to ask and make it easy for them". This is a really practical guide to networking for those who break out into a cold sweat at the mention of the word. Written in a down to earth, no nonsense style it has plenty of tips to get started and connect with your contacts, new and old. Thoroughly recommended. Neil Munz-Jones has written an excellent book which will be relevant to most people. As a Career Transition Consultant I have found that the vast majority of my clients are reluctant networkers. They do not want to do it, they are fearful about how others will react, and they do not know how to do it. Neil's book offers down to earth, realistic, and practical advice which will be of huge benefit to my clients and to all others who find themselves having to network in order to grow their business, find a new job or contract, or gather the advice and information they need to make major life decisions. This book is great news for anyone who needs to network but finds it difficult. Written in a straightforward style, I found this book very readable, practical and motivating. A big help! I never knew that 70% of jobs were found through your network and having spoken to a few people last night at a networking event, they back this up. The job market is dire at the moment and you can spend days applying for jobs through internet adverts, with little success as you compete against the many. It is so much easier to find work through your network, so the book was great at pointing out some really simple, pragmatic steps you can take. Since reading the book and applying a few principle, I have been offered 2 roles in the space of 24 hours. An easy read, written from the perspective of most of us (ie I know I should do more of this but....). Loads of useful and practical tips - strongly recommended! I found this book a hugely enjoyable and insightful read, having taken the opportunity to read it on a recent plane trip. Like most people I initially 'speed read' the book looking for the most relevant sections to my particular requirements, but quickly found out that the book is full of practical advice that I could use in the context of both my home life and work place. The authors skill is NOT just in treading the well worn path of 'networking = job', but identifying and exploring the opportunities that networking creates in achieving greater efficiency / better results within an individuals current work role, as well as the traditional job hunting process. Highly recommended - like me I am sure you will find it being used regularly as a reference tool on how to achieve the best aspects of networking. Was this book written for me! it is really interesting how Neil has managed to understand how we operate, showing our typical behaviour revealing how we all get lost in our ways, I found his experiences and tips extremely useful. The book is very light hearted and full of life's experiences that are easy to relate to and prove if you want to you can net work easily after you get over the first couple of hurdles. You are given tips and a way to form your own plan to network more efficiently whether you are out of work or looking to move to another role. As with everything in life you only get out what you put in so there's no magic solution, I am following the tips and have made a plan and in time I will no longer be that Reluctant Networker. The author aims to give you the tools and confidence to go out there and give it a go. This is a really practical guide to networking for those who break out into a cold sweat at the mention of the word. It's written in a down to earth, no nonsense style with plenty of tips to get started and connect with your contacts, new and old. The book is insightful and touches on real emotional anxieties that EVERYONE feels whether its to look for a new role, expand their consultancy business or as I found even looking for voluntary work earlier this year. The book is easy to read & is full of real events & practical advice. Its like having a conversation with a great mentor & the authors personal experiences provides reassurance & confidence aswell as some practical tools & guidance. Its a 'Must Have' whether your are a novice networker or a seasoned one. Clear, useful, enjoyable to read! I don't usually write reviews on Amazon but for this I have to make an exception. This is one of the clearest self-improvement books I've ever read. The guy knows what's he's talking about. It contains plenty of decent advice which will make a networker out of almost anyone. Thanks Neil! I can thoroughly recommend The Reluctant Networker book to anyone that is job hunting, or looking for a career move. It is written in a personal narrative style, which makes for compelling reading with so many practical tips, particularly for anyone that is serious about engaging proactively in a process to make a stepped advance in their career. As a career management consultant, I recommend this book to all my clients as essential reading. David Jackson, Career Management/ Development Consultant. 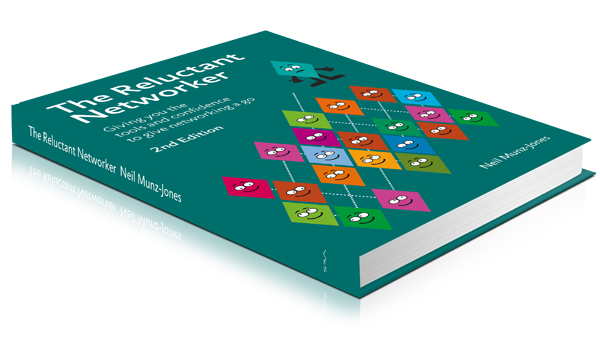 The Reluctant Networker provides straightforward, practical advice on an important subject. Concisely. Definitely worth reading, if you have any concerns in this area (and most of us have). This is an easy, enjoyable read, packed with examples from the authors own experience. It gives loads of useful tips for the majority of us who don't relish the thought of networking. For anyone looking to change jobs, grow their own consultancy or just grow their network of contacts, reading this book makes networking not only less daunting, but actually an enjoyable and rewarding part of modern business. I may never be a natural, but I have started to network and enjoy it, since reading Neil's book. This book is written from the perspective of someone who has been in personal situations through which he has developed his considerable skills. Clears a path through the networking "minefield" and is full of very practical pointers and good insights that add up to making a big difference in building mutually beneficial long term networking relationships. Highly recommended.